I want to Keep Moving and Keep a Healthy Lifestyle. To me the most important things in life are Happiness and Health. Yesterday I have signed up AnleneMove Programme and started my 21-day challenge with 30mins walk at the White Ribbon Run 2015. Yes, I walked instead of run because my injured left ankle just recovered and I am doing it steadily. 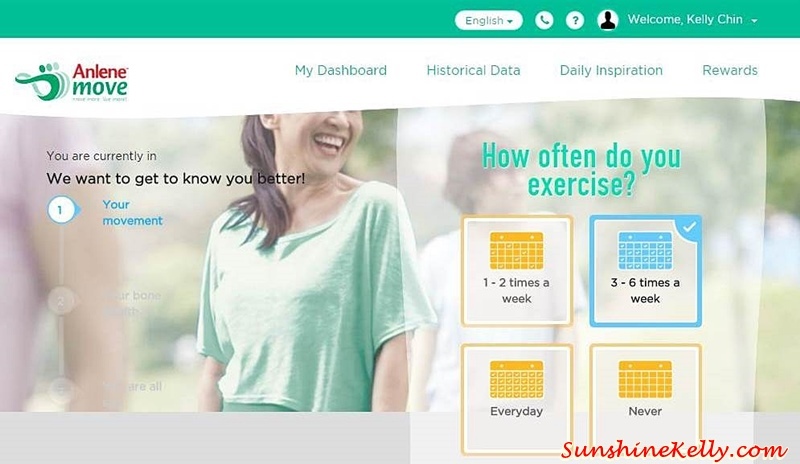 I am glad that AnleneMove is a custom habit-forming programme that tailored to our lifestyle and preferences. 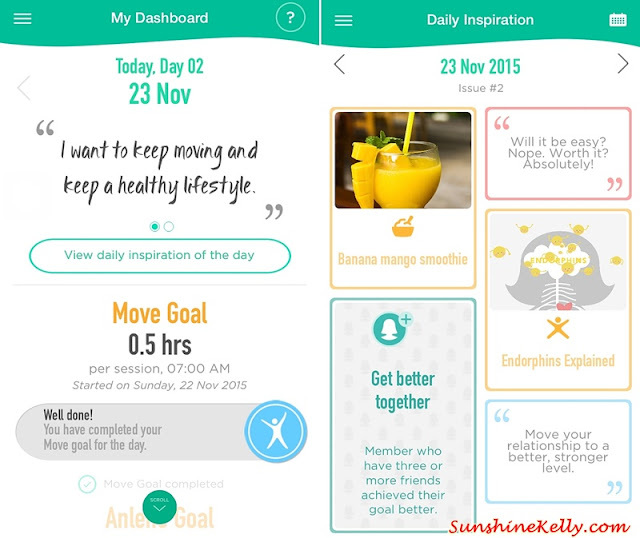 It helps to motivate, track my workout routine and educate me about healthy eating habits. Let me start by asking what is important to you? Of course many of you, will say Family, yes you are right. But if you are not fit and healthy how can you take care of your Family. Love yourself first then you will be able to love and care for others. Second question, when was the last time you actually invest time and effort for yourself? Every day from morning to night our schedule is so hectic we barely have enough sleep. We have to juggle so many tasks, handle stress, don’t have time to exercise and no time to prepare healthy meal at home. These are just excuses. Please put it aside and set your goals according to your ability and prioritize them. You can do it if you want to. Well, most of us are creatures of habit; be it taking the same route to work or drinking a cup of coffee every morning. AnleneMove is here to help and make sure movement and nutrition becomes a seamless part of our daily life as well. It takes at least 21 days to form a habit, so I am embarking this 21-Day Challenge - Keep Moving and Keep a Healthy Lifestyle. At least 30 minutes walk, 3 times a week with the combination of healthy eating and incorporate Anlene milk, concentrate and yoghurt can improve my bone strength and overall well being. Remember freedom to move starts with strong bones. 1. First and foremost is to sign up the program, you can download the mobile app to your smart phone or log in to their website. 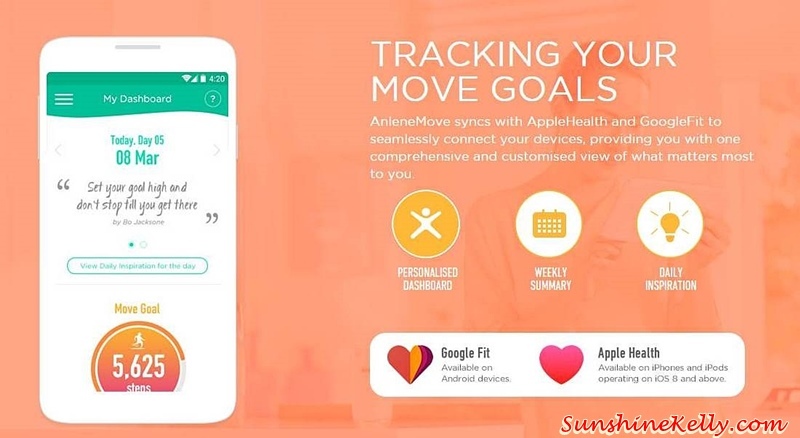 AnleneMove is available on iOS and Android. You can download the app from Google Play and App Store. You will earn points after you have sign up. 2. Personalize your experience, take a quick survey and answer a few questions as soon as you sign up so that the system can customize the program for you. Don’t skip this part as you can earn points too. 3. Set your goals & start. You can choose an activity such as running, walking, dancing, hiking, swimming, cycling, skipping, team sport, tai chi and many more. Set the durations and timing. Don’t forget to set your motivation message too. 4. Earn points and claim your rewards. 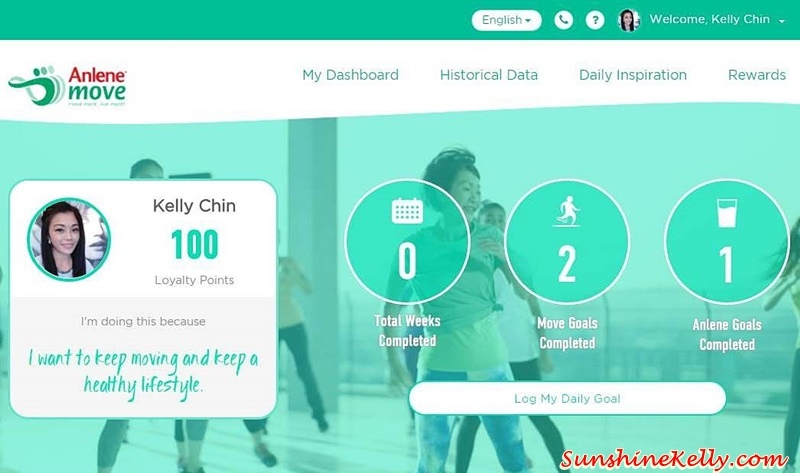 You can collect and redeem points by completing your daily activities. So don’t forget to login your exercise and also your drink. AnleneMove can also track your move goals. It can syncs with AppleHealth and GoogleFit to seamlessly connect your devices, providing you with one comprehensive and customised view. Therefore you can check your weekly movement summary and daily inspiration. Of course, you want to see how your personal fulfillment of achieving your goals translates into rewards right. The loyalty points that you have accumulated can be exchanged for items that further support you to do the things you love. Besides, you also get exclusive promotions and know what’s happening first. here are the examples of what you can earn with AnleneMove programme – stability balls, 1 month KFit membershop and many more on the way. I have 5 units of Anlene Hampers worth RM150 each waiting for you all. In each hamper there are Anlene Gold with BoneMax (Plain), Anlene Regular with BoneMax (Plain & Chocolate) and Anlene Concentrate UHT (Plain & Chocolate). So what are you waiting for? Complete 3 simple steps and stand a chance to win one of them! 2. Set your goals and screenshot your first workout login or your profile from the app or website. Submit your entry via Facebook or Instagram. Please refer to the examples. 1. Giveaway starts from 23rd November and end on 05th December, 2015 (12 midnight). 2. This giveaway is for Malaysian & 18 years and above followers only. 3. Each follower can only win 1 hamper. 4. The winners must response within 48 hours when the result is announced. 5. Winners have to collect the hamper from me. If request to post, the postage charges bear by the winner. Anlene is specially formulated high-calcium milk with BoneMax that contains key nutrients such as FOS-inulin, calcium, vitamin D, magnesium, protein and zinc for optimal bone health. The FOS-inulin in Anlene is a unique mixture of dietary fibers from plant origin that is clinically tested to help increase calcium absorption and bone strength. Anlene now comes with an improved new and delicious taste. You sure are one of the bloggers I know who keep healthy. This is a great initiative from Anlene to promote good health! I read that if we do something for 21 consecutive days, it becomes and habit. All the best in your healthy lifestyle programme. I needa resume my workout regime soon after i recover! For now, a brisk walk would be great for me :) btw good luck to all! Woo hoo! Good luck to those participating. Am thinking whether to participate or not haha! Could do with some good calcium since I have pretty low calcium count. Urgh. Keep up the good job in balancing a healthy lifestyle! You look so beautiful when running.. and thanks for sharing the interesting app. It’s time to move. I have submitted my AnleneMove via Facebook. Haven't exercised for a long time. I guess it's time for me to start. Hi Rawlin, yes guy can join also. I really need this to stay healthy. Will follow the steps and hopefully able to win and to stay healthy also. agree wit the quote : Keep Moving & Keep a Healthy Lifestyle !! omg, it's my turn to do the writeup! :) would love to join this contest! so proud of you gal, you are so healthy :) great initiative from Anlene, bravo! Would love to have this apps for my fitness tracking! I want to have a healthy lifestyle with my family. I have submitted my AnleneMove via Facebook.